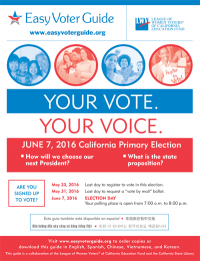 Check out the Easy Voter Guide in English, Spanish, Chinese, Vietnamese, and Korean online now. How will you vote on Prop 50? Legislature to suspend its members, with or without salary and benefits? New Guide to California Government Available - Bulk Discounts! Buy the 16th edition of the Guide to California Government today on Amazon. Looking for discounted bulk orders? Buy more than 25 copies and get a 40% discount by lwvc [at] LWVC.ORG (contacting us) to order.